*The enigmatic energies opened a way across the lightyears, to a sphere like a blue sapphire fifteen feet across. It threw forth brilliance, the glare splashing off the axkeen, hawk-nosed faces of the three Elders who sat, enthroned in a circle, staring up at it. From far across the galaxy the Elders reached out with their minds to survey the Robotech Masters' situation. With the defeat of the Zentraedi more than a decade before and the crumbling of their interplanetary empire by way of the vengeful Invid, their last hope lay in Zor's Protoculture Matrix, the vessel of the mysterious energy source which made Robotechnology and the Elder's rule possible. ...in what remained of Khyron's battle cruiser. ...in what remained of New Macross City. The Historical site of Robotech! They studied the images and data sent to them by their servants, the Robotech Masters. One of them, Nimuul, whose blue hair was stirred by the air currents, mindspoke. His disembodied voice was thick as syrup. The first transignal is of the area where the highest readings of Protoactivity have been recorded. Preliminary inspection indicates that it is unguarded. That pleased the other Elders, but none of them evinced any emotion; they were above that, purged of it long ago. Hepsis, of the silver locks, cheek resting on his thin, long-fingered fist, forearm so slender that it appeared atrophied, watched the transignal images balefully. Hmm. You mean those mounds of soil and rock? His voice was little different from Nimuul's. The three were looking at the transignal scene of the massive artificial buttes that stood in the center of what had once been the rebuilt Macross City. Although they didn't know the history of that long climactic battle of the Robotech War, and didn't realize what they were studying; the transignal was showing them the final resting places of the SDF-1, the SDF-2, and the flagship of Khyron the Backstabber. All three ships had been destroyed in those few minutes of Khyron's last, suicidal attack; all had been quickly buried and the city covered over and abandoned due to the intense radiation, the last place ever to bear the name Macross. But Zor's Vision not only was about sending his fortress to Earth...it was about redemption for sins commited against an unsuspecting species. In order for this to come to pass...his Vision also included...fail safes. Guardians of the Vision....and of the Protoculture Matrix. Nimuul explained, Zor's ship is probably-Wait! But he didn't have to draw their attention to it; Hepsis and Fallagar, the third Elder, could see it for themselves. For the first time in a very long time, the Elders of the Robotech Master race felt a misgiving that chilled even their polar nerves. Three night-black figures wavered in the enormous transignal globe, defying the best efforts of the Masters' flagship's equipment to bring them into focus. The entities on the screen looked like tall, sinister wraiths, caped and cloaked, high collars shadowing their faces-all dark save for the light that beamed from their slitted eyes. Three, of course-as all things of the Protoculture were triad. The area is guarded by a form of inorganic sentry, Nimuul observed. Or it could be an Invid trap of some kind. Fallagar, his hair an ice-blue somewhere between his comrades' shades, gave mental voice to their misgivings. Or it might be something else, he pointed out. Something to do with the thrice-damned Zor. The images of the wraiths faded, then came back a bit against a background of static as the transignal systemry struggled to maintain it. It seemed that the ghostly figures knew they were under observation-were toying with the Masters. The lamp-bright eyes seemed to be staring straight at the Elders. Then the image was gone, and nothing the Scientist Triad or Clonemasters could do would bring the Protoculture specters back into view. White combers of light washed through the blue globe of the transignal imager again, showing nothing of use. By a commonality of mind, the Elders did not mention-refused to recognize-this resistance to their will and their instrumentality. The guardian wraiths would be discussed and dealt with at the appropriate time. YEAH! YEAH! I know it's Zor Prime! 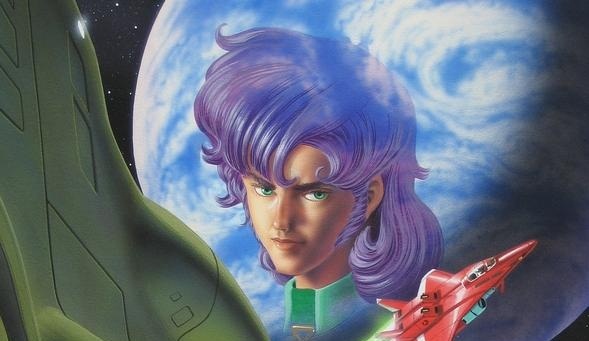 IMAGES: Comico Robotech Comics "Dana's Story"